Water contamination has been getting serious in recent years. You will think of getting a water filter when the water source turns yellow. Did you know that most chemical contaminants are odorless and colorless? These contaminants need to be prevented from entering our homes. Hence, the whole house water filter is the first line defense of stopping harmful contaminants coming through our pipes. Increasingly, many companies come up with various types of filtration system to handle the escalating contamination issues. The technology and system vary according to their specialties. 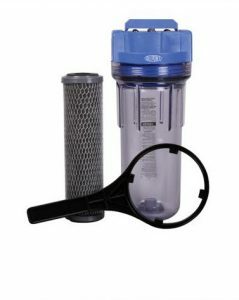 We put together 6 of the best whole house water filter which suits different type of water source. This accompanied with a comparison table to view all its key feature at a glance. Who Is It For? Who Shouldn’t Buy It? The comparison table below provides suggestions on filtration system based on the different water source, budget, and usage. For the majority of us, we are more concern about the initial and subsequent cost of the system. + Feature: Stainless steal frame with pressure gauge meter. One of our recommended water filter for the whole home is the Home Master HMF2SMGCC. It receives a high review score from its existing customers. Most of them love the performance and the filtered water that was produced by the system. Complete Solution: The HMF2SMGCC is a complete filtration system which is capable of removing most of the contaminants for up to 95 percent. This includes chlorine, chloramines, chemical and up to 1ppm of well water contaminants such as iron, manganese, and sulfur. Suitability: For this reason, it is suitable for both city water and well water, provided a well water source is not heavily contaminated. 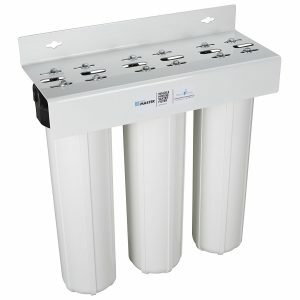 4 Layers Sediment Filter: The first filter consists of 4 layers of sediment filtration with a 1-micron rating to prevent huge particles from entering your home. High Flow Rate: The second filter contains a mixture of catalytic carbon and KDF85 filter provide high absorption of contaminants inside the canister. Coupled with the oversize design of the filter, it maintains a flow rate of 10 GPM. The lifespan of both filters can last for a year or 95,000 gallons of water usage as claimed by Home Master. This system is suitable for a medium household. The HMF2SMGCC comes with a 2-year limited warranty. + Complete coverage in filtration. + Minimal with 2 canister system. – Not suitable for highly contaminated well water source. – No softener capability included in the system. Click on the button above to read the positive feedback and the updated discount on the system. You probably are thinking city water or municipally treated water are safe and clean to consume. You Are WRONG! The water might be contaminated via the pipes that connected to your home. Hence, a whole house water filter for urban water is needed. All In One Canister: The Aqua Pure system has a two in one functionality which performs filtration and softening the hard water in urban areas. 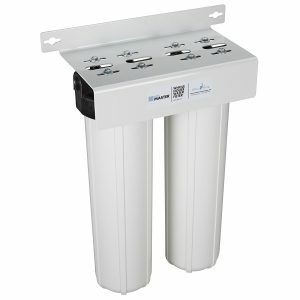 The one-piece filtration system consists of 3 stages which filter huge particulates, chlorine smell that often appears in city water plus breaks the magnesium and calcium bonding to soften the water. Space Saver: It saves space and can be installed in a cramped area due to its design and size. This is suitable for urban areas where space are limited. Excellent Flow Rate: It has a high flow rate of up to 20GPM which is one of the highest among all whole house water filter. Seamless Replacement: 3M design the filter which is small in size and has an easy replacement mechanism which doesn’t require a wrench. It is really designed for urban users. Aqua Pure suggested that the system can last up to 100,000 gallons of water or 1 year before a replacement is needed. The AP904 comes with a 1-year limited warranty. – Not suitable for well water. – Pre-sediment filter is needed as it will clogged the system. Click on the button above to read the reviews and look for the regularly updated discount. The Home Master HMF3SDGFEC is a filtration system which rated highly by its satisfied customer, especially for well water user. Below are some key features that exist in the water filter. The HMF3SDGFEC removes a long list of contaminants. It was claimed by Home Master that it filters up to 95 percent on manganese, iron, sediment, chemicals and other contaminants that create foul tastes and odors. Remove 3ppm of Iron: This system is pretty good in removing iron which often found in well water source. Many customers notice a distinct difference in the clarity and taste of the well water. High Flow Rate: The oversize cartridge design of the system provides higher flow rates of 15 GPM, one of the highest among well water filters. Fine Micron Rating: The sediment filter blocks all particular which are bigger than 1 micron in the first canister with its unique 4 layers sediment filter. As suggested by Home Master, the lifespan of the 3 filters can last for a year or 95,000 gallons of water usage. It is sufficient for a medium size family of 6. The expensive maintenance cost is due to the additional 2nd stage filter which removes iron, manganese, and sulfur from well water. The HMF3SDGFEC comes with a 2-year limited warranty. + As fine as 1 micron filtration. + 1 year lifespan or 95,000 Gallons. + Specialize on well water. – Expensive initial and maintenance cost. The iSpring WGB22B has one of the highest positive reviews for its quality and trusted by many. The brand is strong and well-known in the water treatment industry. 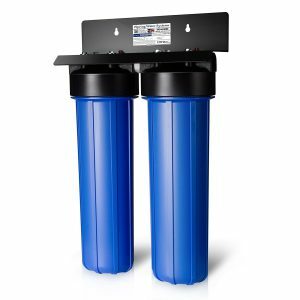 Filter City Water but: The two canister filters focus on removing city water contaminants such as sediments, chlorine, chloramines, and VOC. There are different models to target different water conditions such as the WGB22BM removes iron and manganese while WGB22B-PB removes irons and lead. Instant Difference: Most customers are extremely excited to observe and the instant difference in the water quality especially for those staying in the city. 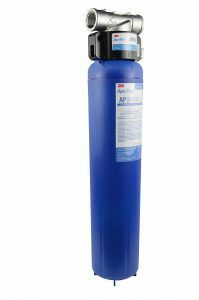 20 Inch Ultrasize Filter: It comes with a 20-inch big blue filter which has more capacity than the previous model and high flow rate of 15 GPM. iSpring suggested that both filters should be changed about 1 year or 100,000 gallons of water usage. It is a decent amount of water for a medium family. The WGB22B comes with a 1-year limited warranty. + Many varieties for different water source. + Affordable initial and maintenance cost. + 1 year lifespan or 100,000 Gallons. Click on the button above to read the reviews. How do you build a whole house water filter system under $100? DuPont whole house water filter is one of the affordable systems in town. It is known for its great filter housing, great cartridges, and affordable price. Fully Customizable: The DuPont whole house water filter is a fully customizable system which comes with a set of filters for one particular housing. The housing that we recommend is the Heavy Duty model. 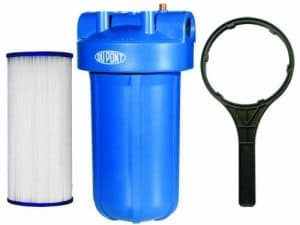 DuPont has three types of sediment filters and two types of carbon filters. Not all of them fit the heavy duty model. Only For City Water: Due to the price and filter’s capability, it is strictly for urban water usage. It removes contaminants like rust, dust, chlorine and low level of lead content. Well waters are too contaminated that the DuPont is unable to handle. Small Size: It is a size of a pre-filter and comes in individual canisters which gives the flexibility for installation. DIY Configuration: The entire whole house water filter system can be customized based on the need to remove contaminants. It can be one sediment and one carbon filter or a double carbon block filters for high chlorine contamination. Due to the small in size, DuPont suggested changing the filter for every 3-4 months or up to 30,000 gallons. The DuPont Heavy Duty comes with a 3-years limited warranty. DuPont Carbon 2 Phase Heavy Duty Cartridge. Express Water is one of the risers that provides an affordable option for water treatment product. This whole house water filter has only been in the market since 2017 but the response so far has been quite positive. Great Filtration Quality: It was advertised that the filtered water from point of entry is drinkable in any faucets. It removes major contaminants such as rust, chlorine, iron, lead, chloramine, VOC and odors. Most customers experience with rotten egg smell are happy after installing this system. Stainless Steel Frame: Build with quality, the system is covered with a stainless steel frame as protection from breaking. Pressure Gauge Meter: A pressure monitoring meter is attached to each and every filter to prevent high pressure from source water. City and Well Water: With the KDF filter as part of the system, it is capable of handling well water source which often comes with lead and iron contamination. Express Water suggest the replacement schedule be 6-12 months or up to 100,000 gallons of filtered water. It is suitable for a medium family. 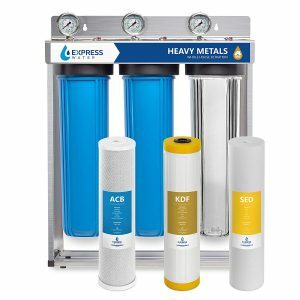 The Express Water Heavy Metal Filter comes with a 1-years limited warranty. + Stainless steel frame with pressure meter. + Capable of handling well water source. Click on the button above to read the reviews and check on the latest discount. Most people are confused with different types of filtration system and its functionality. What are the difference between whole house and drinking water filter? Whole house water filter primary serves as a gatekeeper for preventing water contaminants from getting into the house. On the other hand, drinking water filters provide contamination-free water for drinking purposes. Whole house water filters are often installed right after the inlet of the pipe which is located outside of the house or in the garage. Meanwhile, drinking water filters are often found next to the kitchen sink or under the sink. The benefits of water filter for whole home extend to not just to human, it prevents appliances to be worn out easily. It removes hard water elements which can clog the pipe of dishwasher and water heater. While drinking water filter only focus on providing drinkable water, the filtration systems are quite spot on in removing contaminants. Reverse osmosis system is one of the technique that removes 99.99% of contaminants from drinking water. In terms of flow rate, the water filter for the entire house needs to be quick in producing filtered water in order to cater to the needs for the whole house. Whereas the water filter for drinking doesn’t need to have a high flow rate. Although we listed 6 of the best whole house water filters as our suggestion, it is still depends on your need and current living conditions. Here a quick summary of who should or shouldn’t own a filtration system for home. + After you bought a drinking water filter. Homeowners: They will benefit the most as they are not moving around after the tenancy contracts ends. Hence, we do recommend that house owner to install a whole house water filter. After You Have A Drinking Water Filter: Water filter for drinking is the number 1 essential item when you move into a new place. Whatever is not filtered, will be filtered by you. Later on you can consider on investing on an outdoor filtration system for home. Tenants and Renters: We don’t recommend these people to buy a filtration system for the entire house due to the pricy installation cost. It will blow up your pocket if you decide to move to another spot after 6 months. Low Water Pressure House: It affects the output of filtered water to the entire house. A permeate pump is needed to increase the water pressure. However, it is not advisable. Small Apartment With Limited Space: Apartments tend to be very small in the city. Without a decent space for the filtration system will create a hassle during installation and replacement. While all of the water filters has its pros and cons, you should be choosing the one that suits your needs and most importantly, your BUDGET! Our recommended choice is the Home Master HMF2SMGCC as it small and efficient in terms of producing clean water. On the other hand, it is considered quite affordable to purchase and maintain. Check it out now and start protecting your family from water contaminations.